What is Children Compassion RESH ? Children Compassion RESH is an unit of child development organization RESH that devotes to free children from poverty. Our mission is to work through the Haitian community schools to provide programs of child development to deliver children from economic, physical poverty, social and economical, allowing them to become responsible, fulfilled adults morale. And we speak for children in poverty - to inform, motivate and equip others to become advocates for children. Children Compassion RESH exists as an advocate for children, to free them from their school needs, economics, social and physical poverty and enable them to become responsible adults. How does Children compassion RESH? The brand work Children Compassion RESH is one-to-one child sponsorship. A sponsor is someone who decided to invest personally in the life of a child in need. By the sponsorship, children are able to participate in a program based on community schools that offer life-changing benefits that range from educational opportunities to health care. How and when did started Children Compassion RESH ? Children Compassion RESH began in the heart of a man driven by the wretched orphans of Haiti in 2008. Mr. Saint Eloi Alker was on a campaign to protect children Pereny successfully in the South when he met with the bitter poverty of unwanted children. Upon his return to China (World Urban Forum), Saint Eloi has established a Retreat Council-RESH enabling people engaged in providing food, shelter, education, medical care and Christian education for the orphans of Haiti. This day has been and remains the foundation and core of Children Compassion RESH. Where does the work of Children compassion RESH? Children Compassion RESH works in Haiti and is represented by a head of mission at USA. How Children Compassion RESH chosen partners to work? 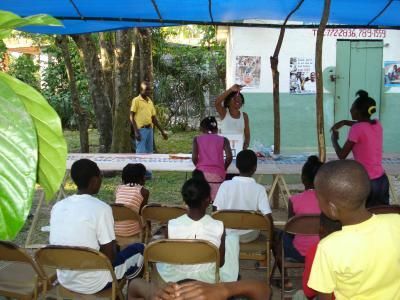 Children Compassion RESH follows a thorough process of investigation, analysis and research for the Haitian community schools and local Assocaite. The efants foreground. Every decision concerning a new beneficiary is wrapped in the condition. - Partner schools and local associations select the children in their communities who need the deepest part of our program. - Risk management and legal issues. The partners should not be obstacles to our legal department. There must be a provision for operations. Our work with associations and community schools to encourage children to long-term economic and social development must be understood and accepted. What makes Children Compassion RESH differ from child development and / or other sponsors? - Focusing on the child. Our mission is committed directly each child as a complete person. - Schools and Associations-Based. We chose to partner with schools and community groups as a local group of believers who can teach, train and mentor children. This is done in partnership with parents and the community. - Clerk integrity. We are committed to excellence and integrity to best benefit the children we serve. We are committed to helping children, families and partners to create relevant activities of child development. We are committed to principles of the highest professional. Sponsoring a child costs $ 20 per month. It is an important commitment, but the incredible difference it makes in the life of a child is priceless. Specific advantages of a child through sponsorship? Children Compassion RESH is receiving, among other things, educational opportunities and assistance, health care, health and supplementary food if necessary, a Christian environment carefully and safely to grow in confidence self and social skills, personal attention, guidance and love. Yes. Each child has a single sponsor, which explains why partners, letters and support mean so much to a child. We believe that the relationship established between the promoters and children plays a role in a child's growth and development. In addition, this one-to-one relationship gives children the message that they have, they are valuable and that someone outside their family who cares about them and their future. Children Compassion RESH need your help ( Donate $ 20/month) Your donation is important for us, we are one together and we can ameliorate the image of the Children in Haiti. God Bless !! !